I’m in part of the Midwest that is getting hit by all this winter weather. It’s cold and when we aren’t getting ice, we’re getting snow (and lots of it.) I’m not really complaining. I know it’s all just part of winter in the north, but I admit, I am starting to look forward to spring. 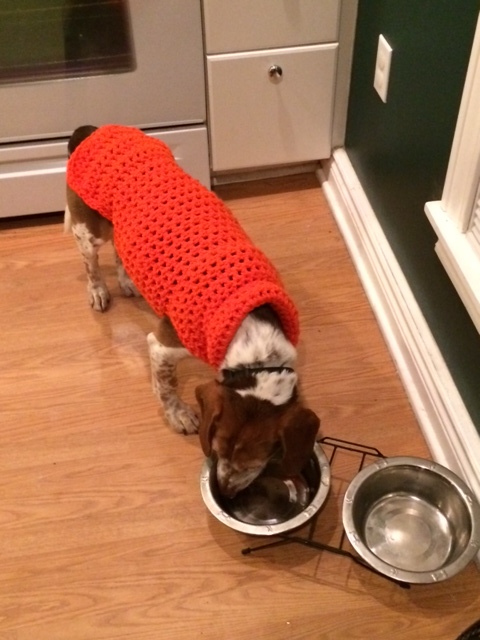 He looks a little like a crocheted traffic cone, don’t you think? People had been saying it was going to be a bad winter all last fall. I didn’t really believe it, or rather, I just figured it would be the same as last year – no snow until Christmas, a wintery January and then right back into a dreary spring. That’s certainly not the case this year! 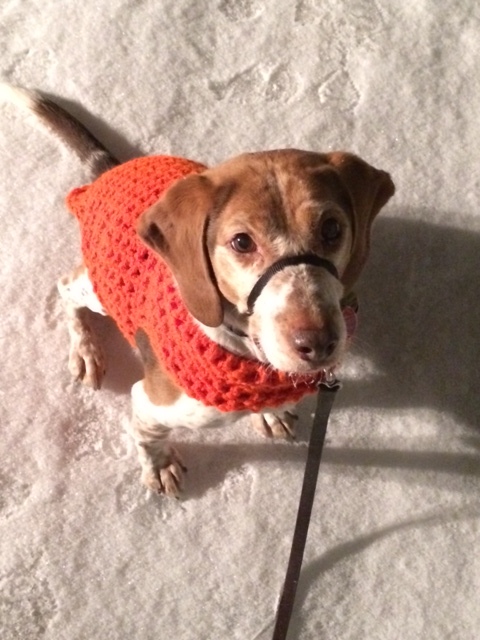 One of my coworkers knitted Hermes a sweater. 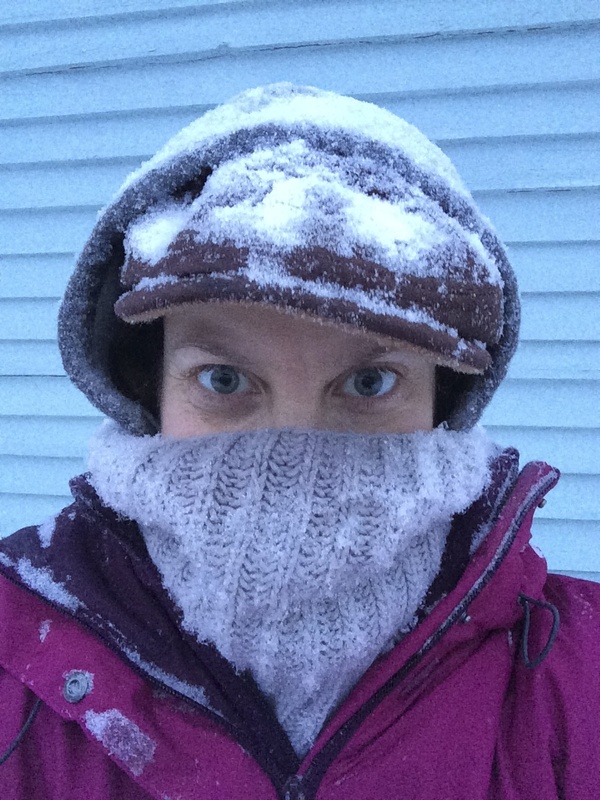 I am usually anti-clothes for my dog, but as I write this it is -4 degrees with a -20 degree wind chills. So, a sweater it is. My coworker knows I am always concerned about visibility so she made it Hunter Orange. I’m not sure he is much more visible at night, but he certainly won’t be mistaken for a deer. He doesn’t mind the weather at all. Honestly, he doesn’t mind much at all. All he really cares about is: food, walks, and fireworks. The first two he loves, the last one he hates. If a sweater means food and a walk (he gets a treat for putting it on nicely,) then he’s all for it. Seriously, he loves this weather. 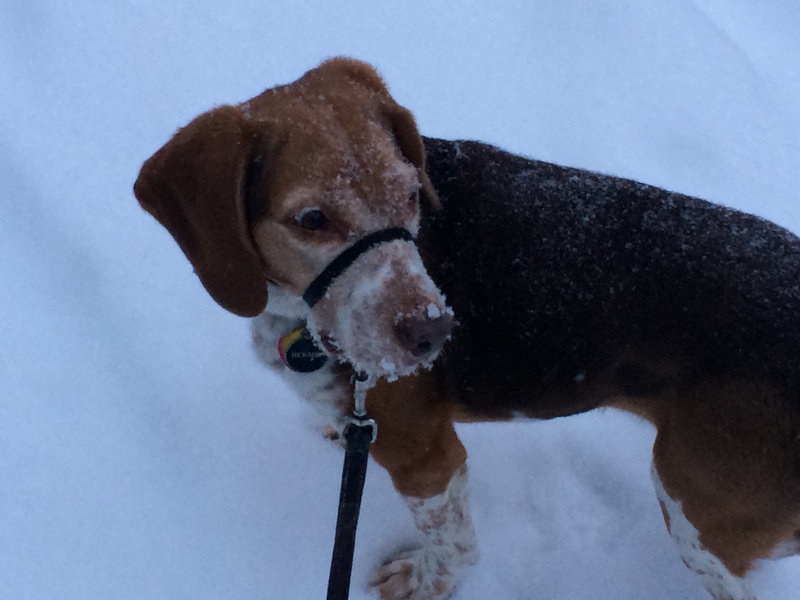 Moments after this was taken he dove head first into a snowbank. I won’t lie, I’ve thought of pelting them with snow balls. …it’s too cold though, the snow doesn’t stick together. One of these days it will be. Does My Face Cause Regrets? 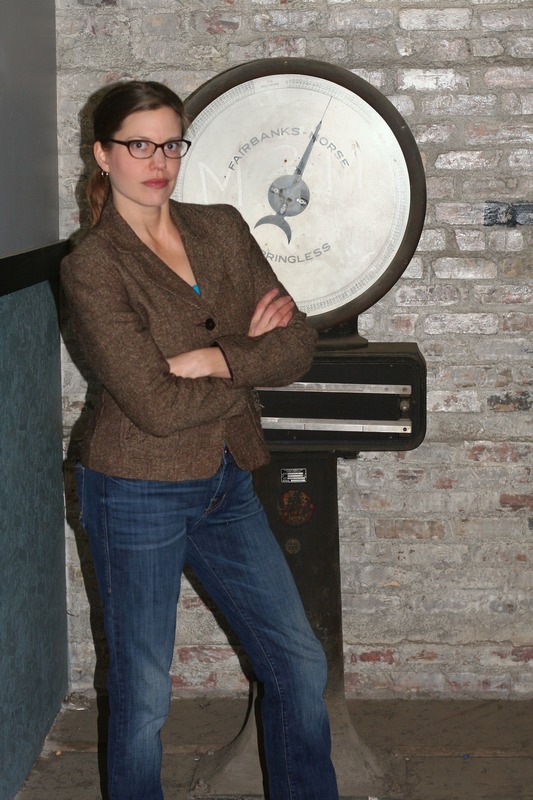 Occasionally I write about the odd “compliments” I’ve gotten since losing weight. Please understand that I know most of these are said with good intentions, and I do appreciate that. I just smile and say thank you when they are given. (I only rant here in the privacy of the internet with you, dear reader.) 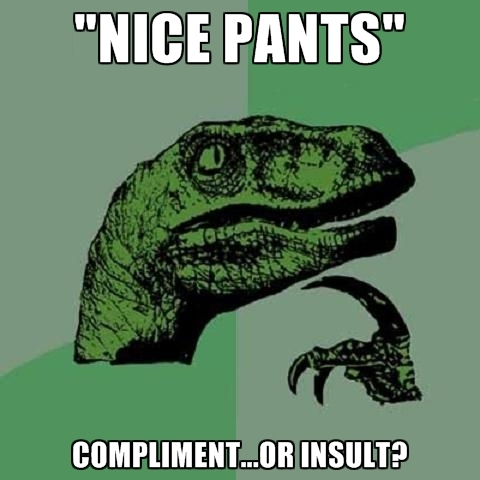 And one final disclaimer – I am not “anti-compliment” or anything. I really do appreciate when people take the time to say something nice or encouraging to me, it’s just that sometimes, when you dig into what has really been said, it isn’t really a compliment. I don’t have many regrets in life, but this photo gives me an additional one. If he just had said, “I don’t have many regrets in my life, but you are one of them.” (and not on a photo of me,) that could have been sweet. Without being on a photo, the comment could be because I am an awesome human being and an all-around badass, and he regrets dumping me for his weird, needy and possessive boss lady. Fair enough. However, when we unpack what he did say, this is what I get: “You look good, now. I regret breaking up with you, now.” Honestly, that just ticks me off. I may have lost a little weight and gotten a makeover, but I am still the same dang person! The photo gives you an additional regret? You think I look attractive (now) and so you wish you hadn’t been a jerk in the 90s? What if I wasn’t attractive? Would you still regret it? Because let’s be honest, I’m still basically the same person I was a year ago. I can’t exactly put my finger on why, but this comment of his makes all my feminist hackles rise. I don’t mean to make mountains out of molehills, and hey, I like the way I look too. I just don’t have any illusions that it makes me any different (better or worse) than I was before. I’m me, for all that that means: good and bad. If you regret being a jerk because you were a jerk, fine. If you think I am pretty, fine. But if you regret being a jerk because I am pretty, you’re still a jerk. What I love about it is that it has some good points without being focused on one particular fitness path. 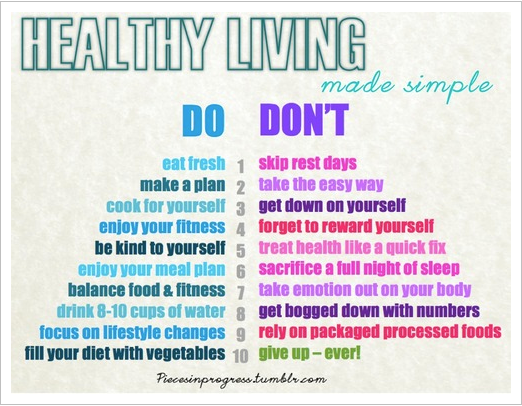 For example, while there are several points about eating, the phrase Eat Clean doesn’t appear. (I wrote about why that phrase gets makes me clench my teeth awhile back.) I have heard some conflicting advice about drinking that much water, but considering it is August and high summer in the U.S., if you’re going to be working out outside, it seems like a good plan to me. I really like the don’s side – especially #1) don’t skip rest days and #4) don’t forget to reward yourself. I think those get forgotten a lot. Since I try to alternate weight training and running, it is really easy for me to skip rest days. (That’s why I don’t get too down on myself when I have a busy week. I just figure they are unplanned rest days.) As for rewards, so far, the results have been their own reward. 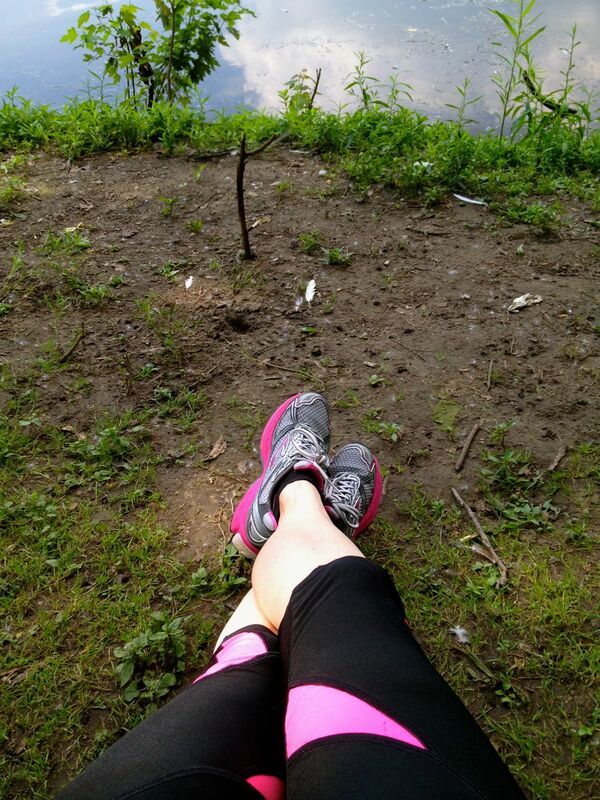 Then again, taking the time to sit for a while by the river after a long run is an awfully good reward. Sitting at the river’s edge after my run.